CLEARWATER, FLORIDA, USA, November 15, 2018 /EINPresswire.com/ -- On November 12th, Boy Scout Troop 313 held their semi-annual Court of Honor, a ceremony which recognizes the achievements of the Scouts over the last 6 months. The ceremony was held inside the Clearwater Community Volunteers Center with 55 attendees, who came to watch 13 Scouts receive their merit badges and rank advancements. This Court of Honor also featured a 100 year-old ceremony for an adult leader, who demonstrated expertise and dedication to the Boy Scouts, bestowing him with the distinguished Wood Badge. 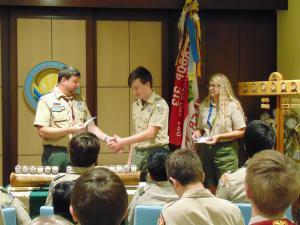 “Being in the Boy Scouts you learn leadership skills so that you can lead other boys, no matter what rank you are. The best part about it is that you get to help the community and see your actions making it better so that people in it are happier and doing well,” said Andrew Lumsden, Troop 313’s Senior Patrol Leader. The Court of Honor began with a Flag Ceremony and Pledge of Allegiance. Next, 12 candles, representing the 12 points of the Scout Law, were lit and the Law recited by the boys before the official ceremony began in which the Scouts and adult leaders received their badges and rank promotions. Troop 313 has held their weekly troop meeting inside the Clearwater Community Volunteers Center since its opening on March 24th. The center provides the venue, catering, and equipment as a complimentary service to the Boy Scouts, as it does to all the non-profit groups that it works with. For more information about the Clearwater Community Volunteers Center or Boys Scout Troop 313 please call Michael Soltero at (727) 316-5309 or email ccvcenter@ccvfl.org.